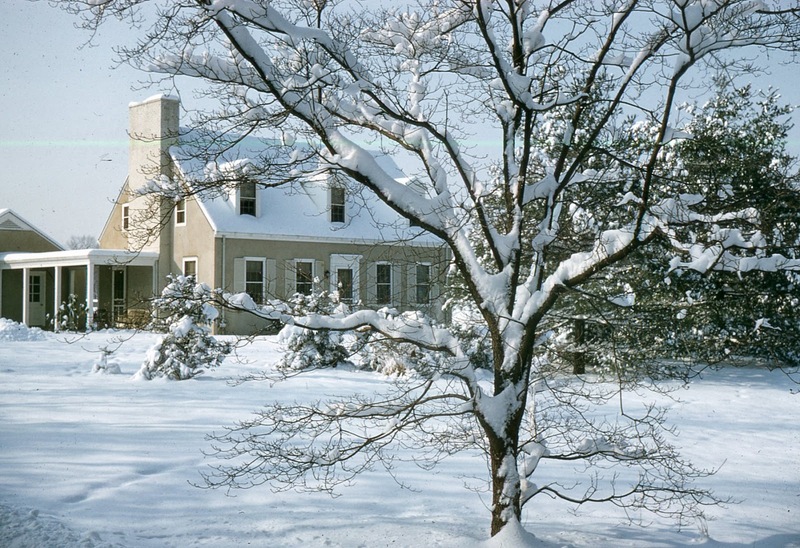 The Diego Suarez estate designed by himself c. 1952 in Brookville. 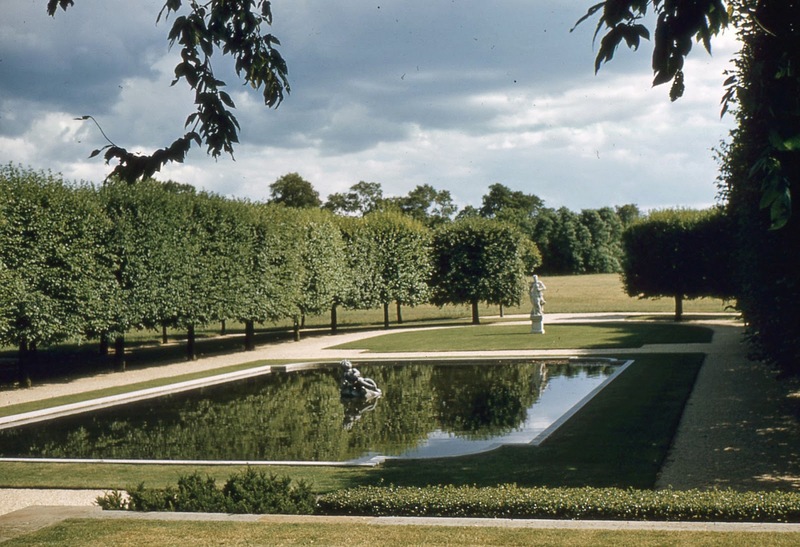 These photos, taken by Raymond Becker, estate superintendent, show the grounds of the twenty acre property. 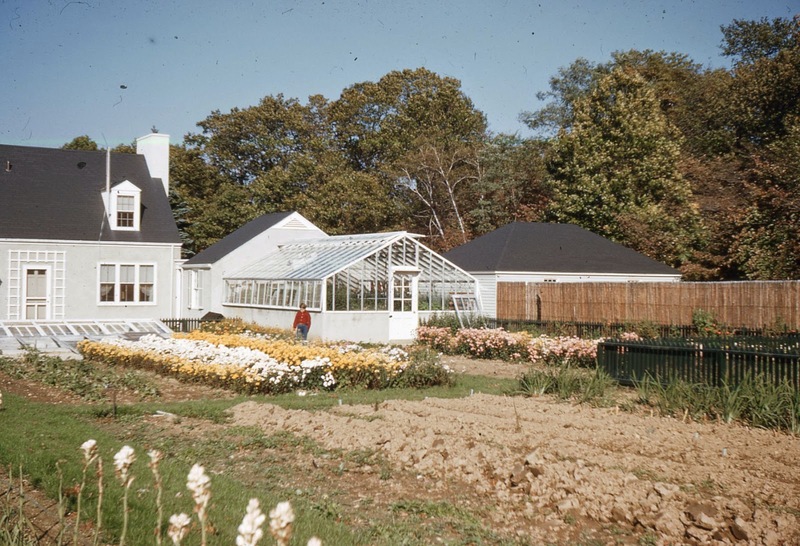 These are truly a rare window into time as the surrounding property has since been developed and the cottage with greenhouse, while extant, have long stopped functioning as such. Click HERE for more on the Suarez estate. What a treat! It is interesting to see the dark (black?) 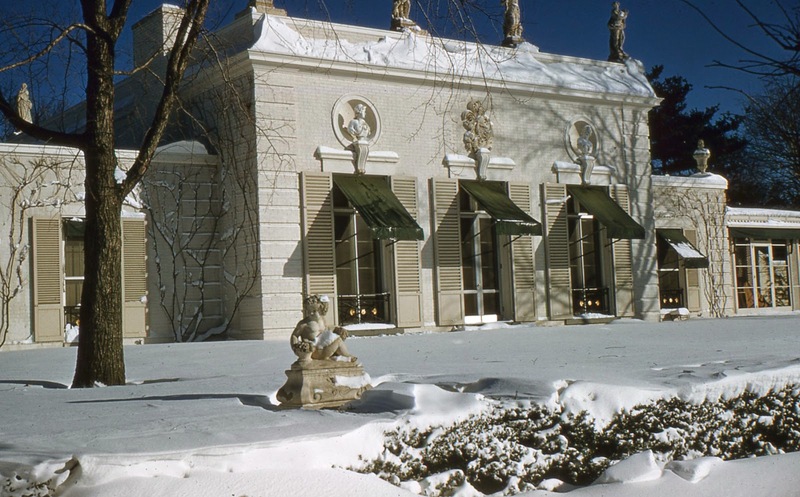 awnings with snow, as the need for shade is usually associated with summer, especially in pre-air conditioning times. I agree about the awnings- odd to see them extended during the winter, but probably just as useful then in protecting all that French furniture and damask from the sun's glare. Yesterday's post indicates the awnings were an odd, avocado green color. But that may be due to the impermanence of color photography pigment. On my screen the awnings yesterday & today both look a shade of green, darker in the winter photos. Responding to a comment yesterday -- I think the roof statuary has been removed; probably due to weather damage since so much else has been preserved. 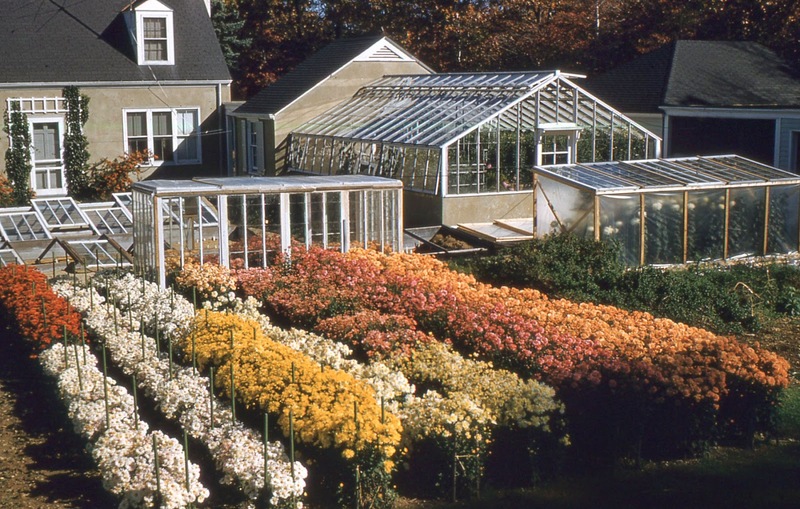 I'm thankful the estate superintendent thought to capture these scenes. He probably wondered if this estate would survive. Magnus, Ancient, DED, whoever else safeguarding an old house/estate -- I hope someone is capturing (& documenting) similar moments at your place(s) for the future. Oh Doug, there's no grandeur here to capture, and I fear that there are many moments here that are best not (says he contemplating the peeling paint on the east side, the garden steps sinking into the ground due to subsidence caused---I kid you not-- by chipmunk tunnels, all those lovely Kodak moments). I'm betting the awnings are dark green. It is not difficult to imagine blinding winter reflecting against the snow. I sometimes have to draw shades in the winter. Actually, as the sun didn't shine this winter, the glare wasn't a problem now that I think about it. 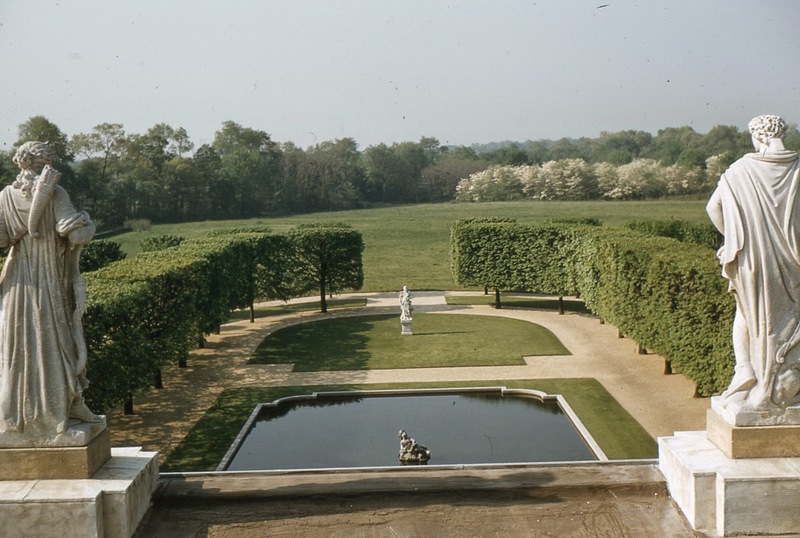 Love the view from the roof, showing the way the controlled formal garden opened into, and borrowed view, from the fields. I suppose that is lost now. 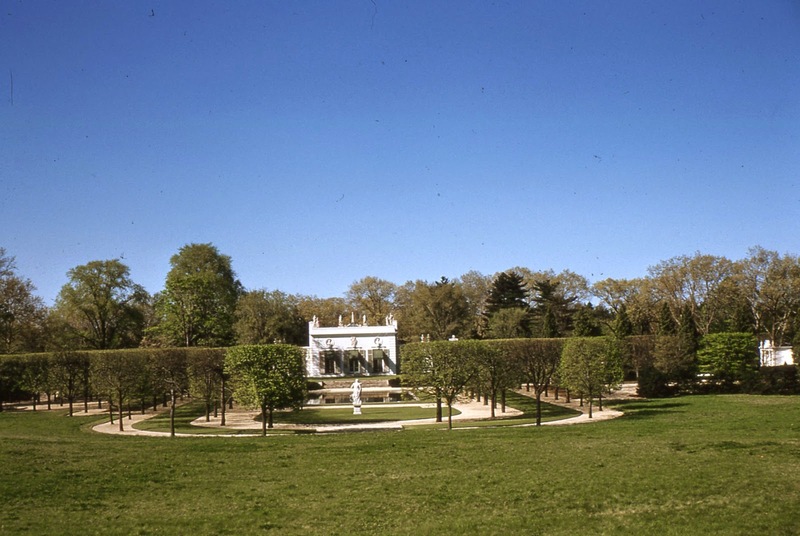 Interesting how the architecture of the house combines the idea of an Italian garden casino and a French pavillon. which had been listed on the market about two years ago for around 13 million US . superintendent of the estate from 1952 until 1976. My father, Raymond Becker, took most of the pictures that are featured on this site. I quickly read the posted comments and can answer a few questions. The awnings were dark green and the brick was painted. The steps leading down to the pool are real grass and they were a lot of work to maintain. Most of the scrubs were boxed. There were Italian and French statues on the house and grounds. 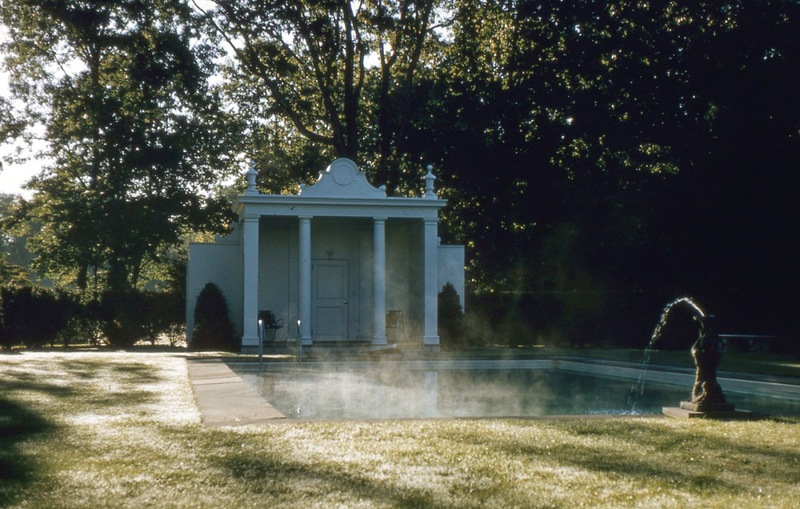 The pool was made of steel and built to provide the best reflection. 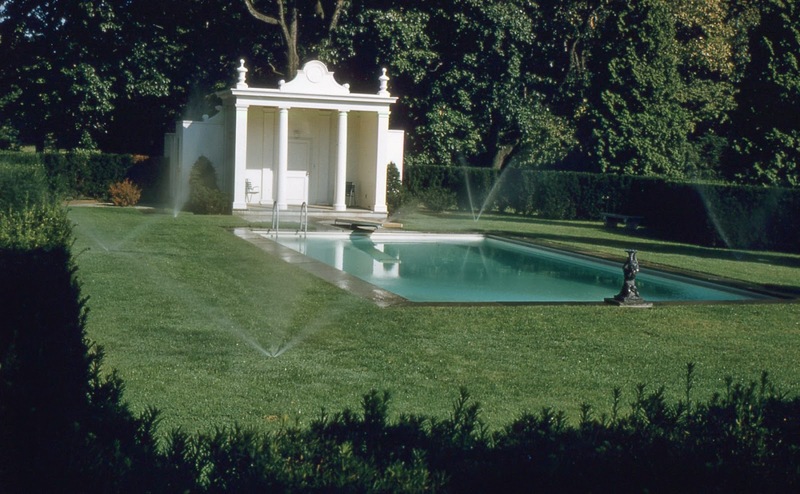 Yes, I noticed that the steps leading down to the pool were grass steps and I thought it must have been a tremendous effort to maintain as they were not straight across, but curved, towards the sides, and splayed down ( if that's the term ) as they descended, in wider curves. This is the first time I've seen images of grass steps not straight across their width. What a wonderful idea ! Thank you, Raymond for taking the pictures, Lance, for your part, and Zach, as always, for this incredible Blog ! Steel refecting pool---fascinating. Indeed a marvelous property. I vaguely remember reading somewhere that architectural details were salvaged from some larger place or building, but can't pull it to the foreground of my cluttered brain. The level of maintenance is extraordinary---it takes not just talent and work, but an 'eye' to keep a property looking that way. Indeed a fascinating series. Dr. Lance, what a lucky boy you were..Living in Brookville back then must have been magical. I would like to invite all readers of OldLongIsland to join me in a boycott of this blog until Zach agrees to do weekend posts. I do not have any information about the property before it was owned by Diego Suarez.